It’s not very often you hear your boyfriend skidding down a sheer rock face. I couldn’t look down, I was loosely gripped to the mountain myself and one false move could result in me tumbling down on top of him. Instead I gripped harder and yelled something nervously. I can’t remember what. The Mongoose was below me and I heard him skid down to Matty, who it transpired was holding on by one rock. Somehow he managed to pull himself back on track and then it was my turn to try and shift my sweaty right hand onto another rock. But I didn’t know how to move. The only two stable stones to my right held my right foot and right leg in place, while my left foot and hand refused to leave the comfort of their sturdy stones. “Delia, move your left foot to where your right foot is and your right to the red stone to your right,” I heard the Mongoose instruct me. It was like playing a really bad game of high-altitude, vertical Twister. But the mat was made of gravelly rock and it was constantly moving. Mini avalanches cascaded down the mountain below us with every unsure-footed step we took. None of us could lose this game. We had to stay ‘in’ until the top. And so we continued to clamber (refusing to look down) – and a few times the Mongoose just sort of pulled me across grip-less sections. Until suddenly we were at the top and the gravel beneath our feet turned into a more secure grass. 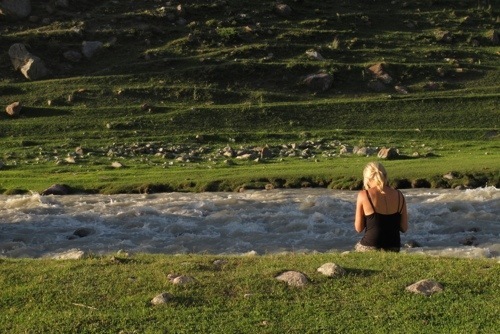 We span in circles, we hugged furiously – and then we saw the clear, easy track to our right that we should have taken for this eight-hour trek. Mongoose muttered something about going back to orientation school. 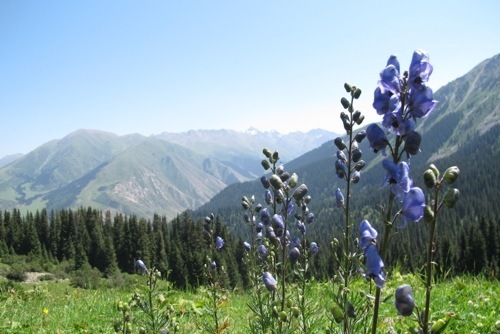 But it was ok because we were in the Valley of Flowers, Kyrgzstan and it was BEAUTIFUL. Bizarrely, perhaps even more beautiful for the arduous route we had taken. That’s me with the graze to prove it. (Yes, I’m wearing pyjama shorts on my head. That’s what happens when you forget to take a hat travelling). 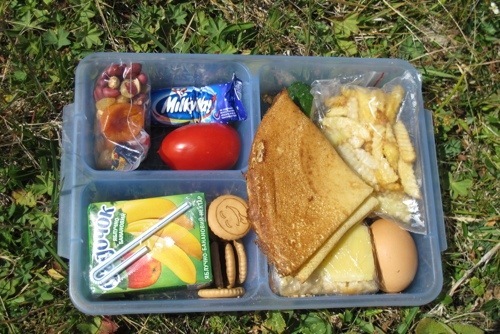 For the record it contained: A cheese sandwich, a salami sandwich, a hard boiled egg, a bag of cooked chips (yes, my friends I had egg and chips in a packed lunch), two pancakes, a delicious pasty filled with spiced mince meat and onions, a bag of nuts, raisins and sweets, a Milky Way, a cucumber, a tomato and a fruit drink. That’s me with my egg and chips. Oh, and some wonderful biscuits that tasted just like Rich Teas but looked much happier. And then, sitting in this glorious spot with the sun beating down on my shoulders, it dawned on me just how much my life revolves around food. 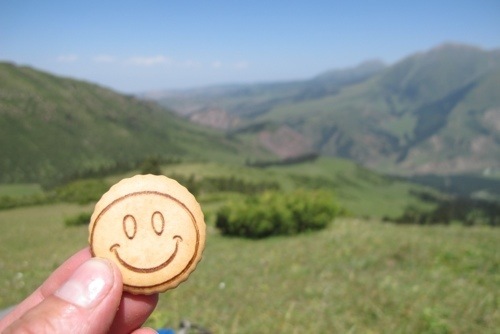 There I was in some of the most stunning scenery we have seen on the trip so far, and I was photographing smiley-faced-biscuits – and raving about a packed lunch. That box of goodies had given everything a slightly rose-tinted filter (a bit like I was looking at the world through a cool Instagram filter). With that in my bag I could climb any mountain, reach any star, run at any flock of sheep (this might have happened – I blame the biscuits), I was invincible. And so we scoffed our fabulous packed lunch at our fabulous picnic spot and then climbed another two peaks before heading back down to our yurt stay for dinner. And I knew dinner was going to be great. As a significant addendum to my recent rant at Central Asian food, the grub in Kyrgzstan is bloody good. 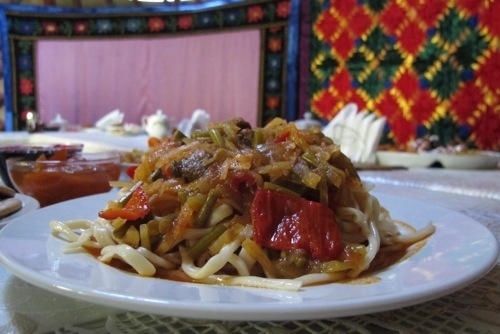 Clearly influenced by its Chinese neighbours, the traditional Central Asian dish of laghman (noodles, bland sauce, and unidentifiable pieces of fatty meat) has been transformed into a delicious tangy tomato dish, ladled with roasted vegetables and chunks of tender meat. Plus, on every table salt and pepper shakers are joined by a delicious chilli and garlic paste that has the ability to make even the blandest dish come to life. 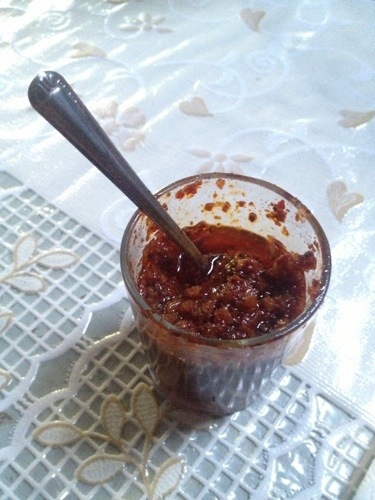 But in Kyrgzstan the food isn’t bland. This, my friends, is the flavour island in a bland ocean of slop and oil. 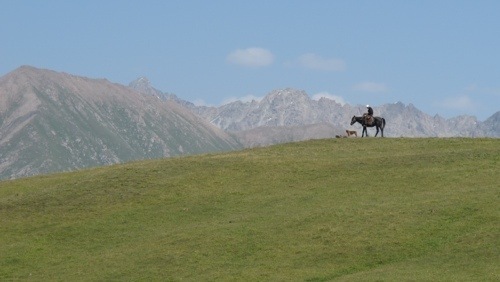 And some of the best food we’ve had in here so far has been at this fairly remote Yurt Stay in Valley of the Flowers, just 40 minutes or so away from Karakol. It was the folk here that whipped us up the fabulous packed lunch and where we were returning for dinner. 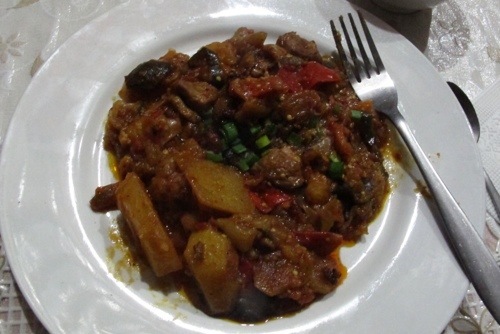 A delicious stew of vegetables, potatoes and tender beef steak cooked in a rich, spicy tomato sauce with a huge bowl of tomato-pasta soup on the side. Oh, and warm freshly baked crunchy bread on the side – and more happy biscuits. And that is why I know tomorrow is going to be another great trekking day. I’ll be starting it with rice pudding (a common breakfast in Kyrgzstan – yet another reason to love this beautiful country), continuing it with another packed lunch and finishing it with a scrumptious hot meal back at the yurt stay. And then I shall brush my teeth under the stars and dream about walking up salami and cheese mountains with cucumber rocks. I blame the biscuits. Ah, thanks so much Carol, its lovely to hear from you! I can’t believe how quick its all going – China in a week, mental! 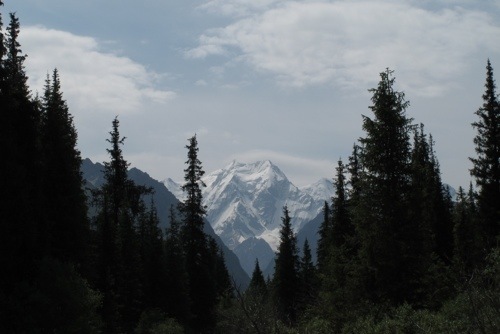 well, Kyrgistan seems sooooo nice!! I want to go there!! Enjoy guys!! and keep on writing!! it’s really great!! I love it!